I rather enjoyed this episode. Have I surprised you? I’ve seen a lot of disappointment on Twitter, contrasted with a bunch of other people shouting about how it was PERFECT and haters are gonna hate. Given my feelings about recent Moffat Who you might expect me to be in the former camp. OK, I don’t think it was perfect – far from it! – but we’ve seen a lot worse in recent times, and there was a lot to enjoy. A weird phenomenon has been spreading over Wi-Fi. Open wireless connections are appearing with weird symbols as names. If you select that wi-fi your consciousness is uploaded to a mainframe and within a day your body dies. Meanwhile, the Doctor has been hiding out in a monastery in 1207, trying to get the peace of mind to figure out what’s going on with Clara Oswin Oswald and why he keeps seeing her in different places. Until, that is, the TARDIS phone rings, enabling the gag that names the episode, as the TARDIS has a St John’s Ambulance sign on its door. The call is from Clara, who has been given the number of the TARDIS’s fake phone (which ought to be just a part of it’s camoflage as a police box) as an IT helpline. The Doctor realises it’s her and goes to find her. Together they take on the uber-coporation. There was a lot of fun in this episode. The joke of the title was a little throw-away and contrived, but in that kind of groan-joke way that’s completely appropriate for Doctor Who. 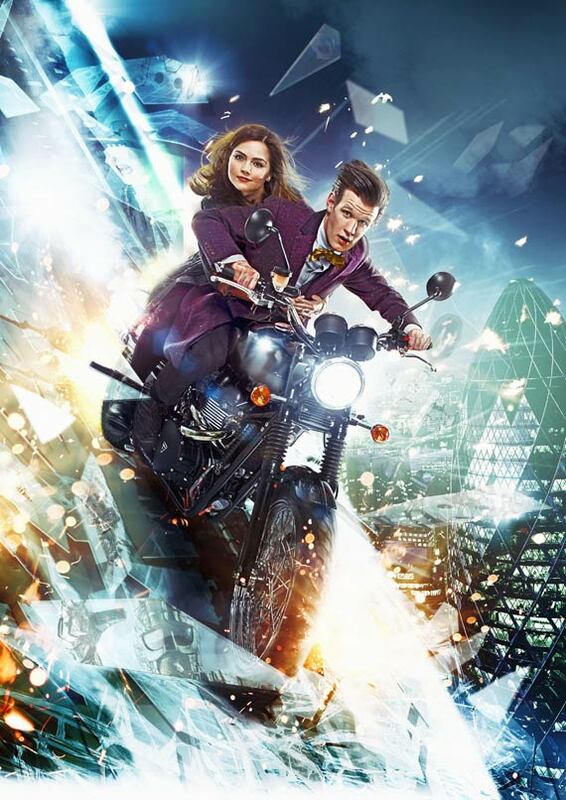 Matt Smith was on fine form as his bumblingly eccentric Doctor who’s surprisingly smart underneath. Very Sylvester McCoy mixed with Patrick Troughton and a dash of Paul McGann. I like it. I liked that the fez and bow tie came out again, and I enjoyed the gag that monks’ robes are ‘not cool’ in contrast to such stylish accessories. Perhaps some find touches like this gimmicky, but I love them I love them for their eccentricity and because the Doctor has always had such peculiar quirks – recorders, capes, scarves, celery, umbrellas, hats… they make me smile, and they’re a great feature for a kid’s TV show. Kids can pick up on them and feel like they’re in on an in joke, and they can very easily play at being the Doctor just by getting hold of an inexpensive item like a fez or a clip-on bow tie without going full Comic Con regalia. That’s important because it’s inclusive, and because it helps spark children’s imaginations – especially when it’s encouraging them to think about what counts as ‘cool’ in different ways, and in ways that change over time. It’s important for showing children how to be more accepting of differences and to be more experimental in their own thoughts, as well as fashion choices. Whilst the ‘be careful what you share over the Internet and beware of using and/or stealing unsecured Wi-Fi’ moral was a little obvious, I didn’t particularly mind. On the one hand it felt a little technophobic, but the Doctor and Clara didn’t respond to the crisis with a full on Sarah Connor Computers-Are-Bad routine. They used computers to retaliate against the human enemy, which was the real culprit for its misuse of technology. I liked that they incorporated the Shard, an awesome piece of modern, futuristic architecture so new that I haven’t even seen it yet, but which has dramatically changed the London skyline. It’s fun, it’s exciting, it’s current, and it presents the future as something that we’re involved in creating, rather than merely something the Doctor can show us. I liked Clara’s common sense response to a strange man landing on her doorstep demanding to be let in, and that only when he’s shown her a good reason to suppose it’s more dangerous to remain outside than to enter his small box does she agree to do so. I liked the foreshadowing of a mysterious woman giving Clara the Doctor’s number (I’m guessing Rose?). I wondered if there was a deliberate reference to the Meddling Monk (a Time Lord antagonist of the First Doctor) in the Doctor’s hiding out as a monk at the beginning. And I LOVED that they got Richard E Grant in for the mysterious baddy. He’s a fantastic actor with oodles of charisma, and it’s a nice touch, what with him having played an AU Doctor in ‘The Curse of Fatal Death‘ and the animated adventure produced for Doctor Who’s 40th-anniversary, ‘The Scream of the Shalka‘. With the 50th anniversary coming up, we can expect big things, there, and it’s good to feel like we’re building towards that. Despite the fact that Moffat is now clearly aware of what people feel about his sexist attitude towards women (I don’t condone him being bullied off Twitter, but I assume it at least made him aware of the groundswell of feeling) he persists in throwing out sexist ‘gags’. Having the monk ask ‘Is it an evil spirit?’ and the Doctor reply ‘It’s a woman’ as though the two weren’t that dissimilar… it’s only funny if you hate women, which is out of character for the Doctor and a really bad message for kids. And… it’s doing you no favours, Moffat. It’s not just a few crazy feminists you’re continuing to poke with sticks because, for some reason, you think that’s funny, it’s 52% of the population that you’re insulting. We are watching, too, and some of us are little girls learning what the world thinks of our gender. Having it derided by an icon like the Doctor is pretty awful and entirely unnecessary. Not to mention the little boys who are learning about acceptable ways to interact with women. On a similar note, I have some sympathy for the criticisms of Clara’s character as one-dimensional, used as a plot device and not really developed. As noted above, I do think she had some interesting elements of independence, but she has fallen into the tired old format of flirting with the Doctor. Although she says ‘come back and ask me tomorrow’ it’s token resistance that is presented more as a tease than any real sense that the Doctor’s being out of line in assuming that any woman who’s asked would willingly go with him. As others have noted, she’s too much like Amy and Riversong and all the other women Moffat writes, and not enough like a real woman with a personality that doesn’t revolve around her relationships to men. I am uncomfortable with how similar her speech patterns are to Riversong’s. ‘Run you clever boy’ is clearly drawn from the same smugly over-familiar well as ‘Hello, sweetie’ and, sexism aside, that’s just bad writing. I also found some of the science a bit too silly. If the uploaded minds have been ‘fully integrated’ I don’t see how any of them could be re-downloaded without going mad. The cognitive scientist in me is irked. But on this point I am willing to subside and say ‘it’s Doctor Who, that’s just how it is’. Although this plot bore some similarities to ‘The Idiot Box’, I find the criticisms that it’s just a straightforward copy somewhat unkind. There was much more to the premise than an alien being simply absorbing minds. There was also a concept about integrating and altering minds – inducing paranoia, increasing intelligence, adding skills, enforcing obedience… some real interesting questions about the nature of personal identity and free will. Overall, I found this episode considerably better than I expected. I still have serious problems with Moffat that I don’t think are going to go away. He seems to be digging his heels in on the sexism thing rather than listening to the voices of what women themselves think about his characterisation (or lack thereof) of them. But this was at least a fun episode with a good plot, some interesting ideas and a cohesive presentation. It was not a return of the ever more complicated confusions of the Riversong plot, and laid some stable ground for what I am tentatively hopeful will not be a complete train-wreck of an anniversary. This entry was posted in Doctor Who, Review and tagged Clara Oswin Oswald, Doctor Who, feminism, Matt Smith, Meddling Monk, review, Richard E Grant, Rose, sexism. Bookmark the permalink.